As we’ve all learned from recent incidents at large companies, a data breach can cause insurmountable damage that is difficult to rebound from. To effectively counteract cyber attacks, companies need to have a two-pronged approach that includes both targeted threat intelligence and expedient incident response (IR). In this webinar, Scott Donnelly of Recorded Future, will explain how threat intelligence can help secure your company, how to implement an intelligence strategy, and how a thorough threat intelligence program can reduce the risk of breaches. 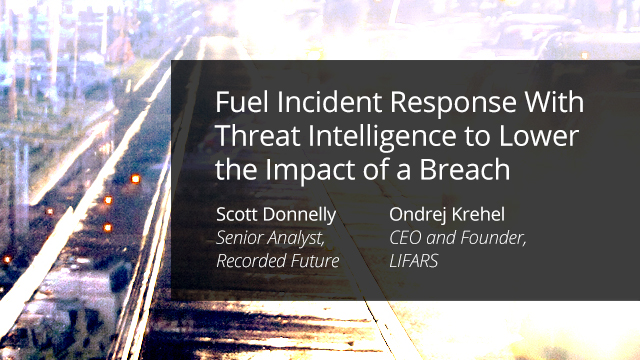 Next, LIFARS CEO and Founder Ondrej Krehel will discuss how this intelligence spearheads an incident response and describe the process of investigation and evidence collection. * How threats manifest in different ways on different layers of the Web. * The difference between a hoax and a possible threat to companies, customers, or infrastructure. * How having the right threat intelligence will speed up an IR process and reduce the business impact of a data breach. * The steps of an effective IR and how having a proper incident response plan in place makes all the difference.